ABSTRACT: Greg Upton is Assistant Professor at the Center for Energy Studies at Louisiana State University. The Center for Energy Studies conducts, encourages, and facilitates research and analysis to address energy-related problems or issues affecting Louisiana's economy, environment, and citizenry. The Center's goal is to provide a balanced, objective, and timely treatment of issues with potentially important consequences for Louisiana. 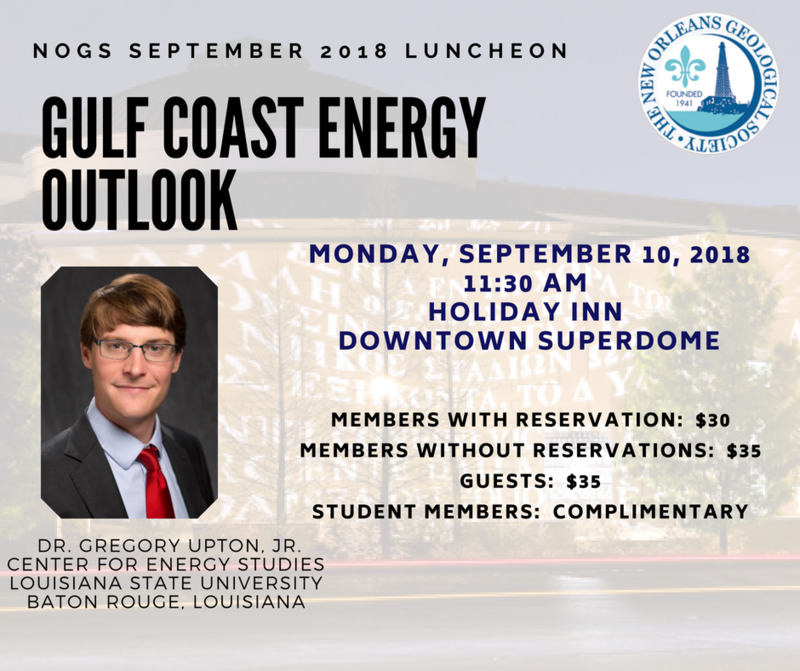 Dr. Upton will discuss how U.S. shale oil and gas is continuing to drive U.S. production records and the implications for Louisiana are significant. What will happen to conventional production? And how will the refining and chemical industry fare? Dr. Upton will discuss the ramifications of the energy transformation of the past decade and provide an outlook for coming years. He will also discuss potential tax policy changes in Louisiana in coming years and how it might impact up-stream producers. MORE ABOUT DR. UPTON: Dr. Upton’s research interests are related to the analysis of economic, environmental and public policy issues in energy and regulated industries. During his tenure at LSU, Dr. Upton has addressed a number of topical energy issues of significance to Louisiana, including the impact of the oil price collapse on Louisiana’s budgetary challenges, solar tax credits and net metering policies, implications of the crude oil export ban’s lifting on the Louisiana economy, and the adequacy of the LOSCO oil spill fund, among others. He has presented research on these topics to more than 40 industry and academic groups over the past four years, has been cited more than three dozen times in local and national media including the Wall Street Journal. He has written guest columns about energy related issues affecting Louisiana appearing in the Baton Rouge, New Orleans and Acadiana Advocates, Baton Rouge Business Report, New Orleans’ Times-Picayune, Lafayette’s Daily Advertiser, Public Utilities Fortnightly Magazine, among others. Dr. Upton holds a Ph.D. in Economics from Louisiana State University where he also received both an M.A. in economics and a B.S. in economics with a concentration in empirical analysis. He is a member of professional organizations such as the American Economic Association (AEA), International Association of Energy Economics (IAEE), Association of Environmental and Resource Economists (AERE), and the Southern Economic Association (SEA). He has taught courses the Department of Environmental Sciences and Department of Economics at LSU and is a program faculty member at Michigan State University’s Institute of Public Utilities, one of the country’s premier education programs for public utility employees and regulators.